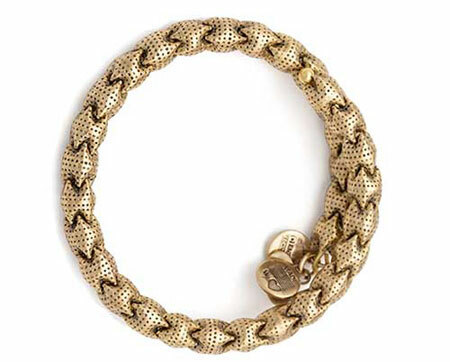 We are noticing an increasing number of fashion brands with a great collection of personalized charms and bracelets (Pandora, Nialaya to name a few well-known brands). Our latest exciting find? 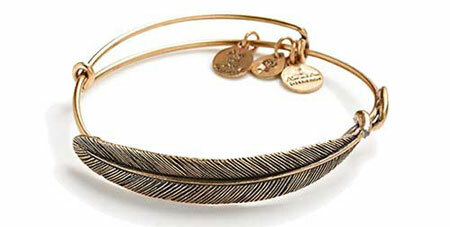 Alex and Ani. What makes so exciting about them is that each jewelry piece (whether it’s a bangle, bracelet, ring, or necklace) carries a special meaning to help improve a certain aspect of your life (love, courage, more energy….they have it all). 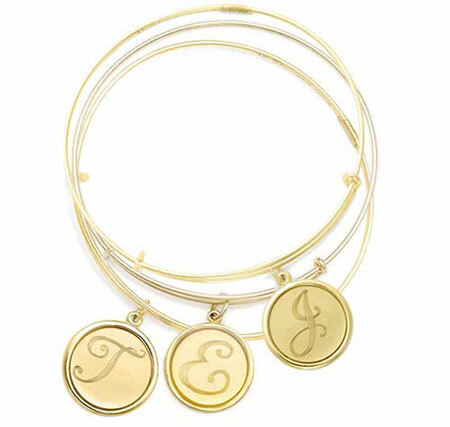 Here, we picked the 6 Alex and Ani’s most amazing looking bangles that you will absolutely love. 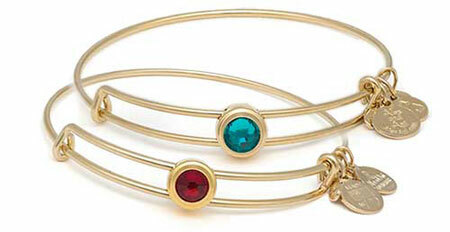 The Carousel Expandable Wire Bangle showcases round, marbled beads and small, glittering crystals. Design Inspiration: As the carousel revolves, music echoes across the fairground and warmly glowing lights illuminate a collection of brightly painted horses. Meaning: Inspired by the intricate beauty of this spinning ride, it is meant to be worn as an affirmation to embrace the exhilaration and thrill of the world as it sails by. 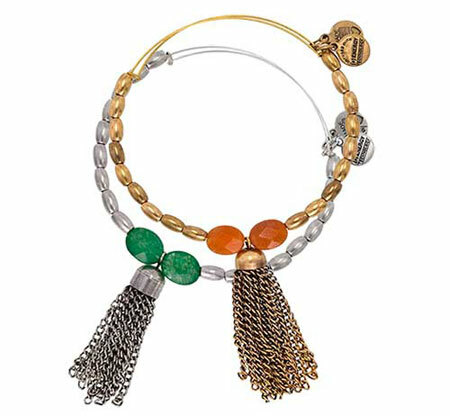 Design Inspiration: Bangles inspired by 7 Chakras located in our body – this collection emphasizes the idea that each chakra is associated with a specific color that affects the body in a particular way. Utilize the power of these hues to balance your energy and apply bright vibrations to your mind, body, and soul. Meanings: The scared studs collection has over 10 different colors and each color symbolizes something meaningful in life. Below, I created a chart of Alex and Ani Sacred Studs and their meanings. Pick one or two symbols you want the most in your life! Design Inspiration: Created with sterling silver and 14kt gold filled metals, the Precious Metal Collection showcases pieces to be cherished for a lifetime. A tassel made entirely from delicately linked chains hangs beneath a sweeping row of elegant, polished metal beads and two larger, brighter beads complete the look. Inspiration: Artist’s palette – where experiments are made, risks are taken, and an artist’s masterpiece begins. 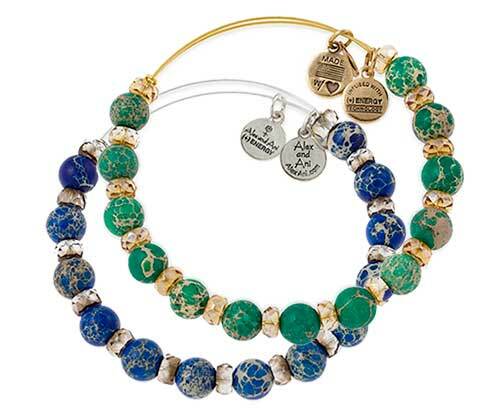 Meaning: As you embark on your own creative journey, let the unique splendor of the Artist’s Palette Beaded Bangle showcase your daring and original side. Inspiration and Meaning: Inspired by ancient belief on a symbol of feather – It represents light and air, a feather is the bearer of truth and justice. Ancient Egyptians believed a pure heart weighed as light as a feather. In Christianity, feathers represent virtues of charity, hope, and faith. Bestow the feather to seek wisdom and reach new heights. 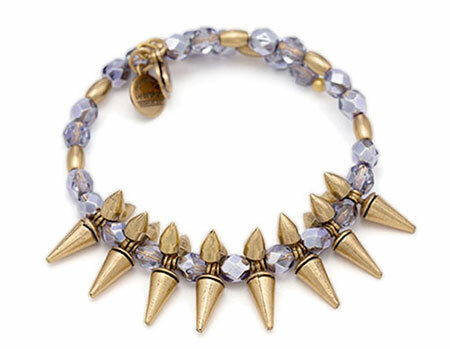 Encrusted with glittering spikes and crystals, this ornate wrap is boldly feminine. Meaning: Confidently move forward to seize any opportunities that you dare to dream up. Inspiration and Meaning: Inspired by the iconic style of the 1920s, it is designed encourage an inherited, eccentric way of thinking, feeling and doing.